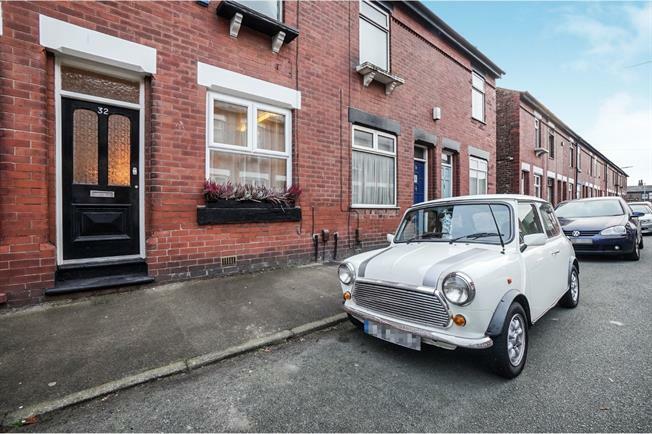 2 Bedroom Terraced House For Sale in Altrincham for Offers Over £230,000. A recently re modelled and decorated room having uPVC double glazed windows to the front and rear aspect and fabulous strip wood flooring. The living area has a feature chimney recess with hidden lighting and fabulous cast iron fire surround, the dining area has feature open staircase with rope rails. The kitchen area is beautifully presented and has a uPVC double glazed window and double doors to the side elevation. This recently installed bespoke kitchen has a selection of base and eye level units with custom leather handles and bespoke concrete work surfaces and tiled surrounds, inset into which is four ring gas hob with decorative extractor over and fitted oven with steam facility and sink with mixer tap over. Integrated dishwasher and recess for a washing machine. Another recently remodelled room having floor to ceiling travertine tiles and a uPVC double glazed window to the rear elevation. Fitted with a white suite comprising, panelled spa bath with power shower and rainfall head over, wash hand basin and low level wc. Fitted heated mirror with blue tooth and shaver point, recessed spot lights. A beautifully presented and recently updated generous bedroom with a boutique feel and having a uPVC double glazed window to the front elevation.